Is UC Berkeley building a bonfire during fire season? If you are watching the news, you know that wildfires are raging all over California. One of those fires destroyed most of the small town of Weed a few days ago. The San Francisco Chronicle reported that fire and made a rare acknowledgement of the flammability of native California vegetation: “…the native fuels adapted over thousands of years to the lightning-caused fires that regularly broke out in California. The most problematic in a drought situation, he said, are manzanita, younger ponderosa pine trees and incense cedars. The three are all highly flammable and close to the ground, creating a fuel ladder from the grass to the overstory trees.” The article also noted that fires usually start in grasses and are then fanned by high winds into wildfires that destroy everything in their path. Yet, the fiction continues in the San Francisco Bay Area that only non-native trees are to blame for wildfires and that they must all be destroyed to reduce fire hazards. In fact, when the trees are destroyed, the unshaded ground is quickly populated by grasses that are the type of vegetation in which virtually all of our fires start. In the height of fire season, UC Berkeley has recently destroyed many trees in the East Bay Hills and left them lying on the ground to dry out. These huge piles of dead vegetation look like bonfires waiting to happen. We are grateful to our readers for alerting us to this new round of destruction. They have given us permission to publish their letter to the Federal Emergency Management Agency and UC Berkeley. We hope you will consider writing your own letter to express your concern. We are writing to tell you that UC Berkeley is in the process of destroying eucalyptus and some pine on its property. 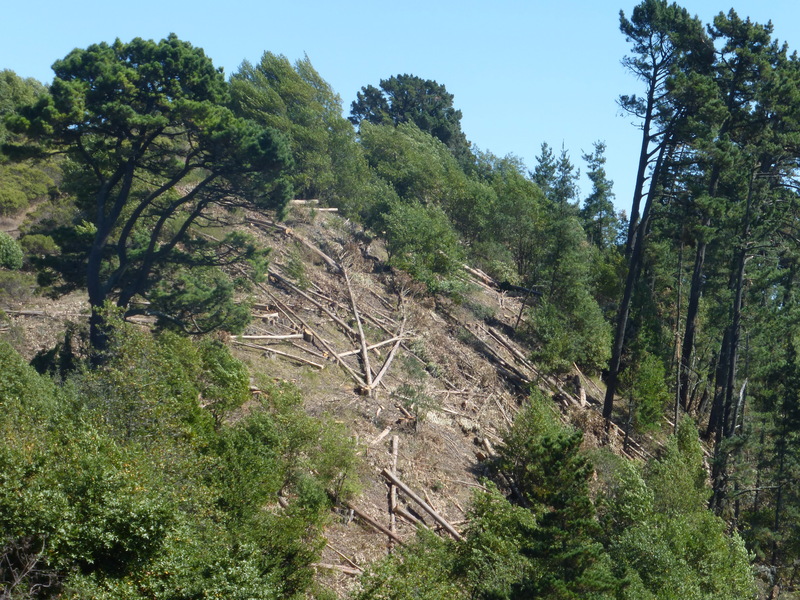 Judging by the Pesticide Application Notice posted on Grizzly Peak Blvd near South Park Drive, the trees were destroyed August 24-26, 2014. The scale of the removals is not entirely visible because the property goes down a steep slope that we could not cover. Based on what was visible to us, it appears that at least 100 trees were destroyed on a few acres. We believe the trees are being destroyed within the area for which UC Berkeley has applied for a FEMA grant to remove all non-native trees. We have used the maps in the Draft EIS to make this determination. Therefore, it seems appropriate that FEMA should be informed about this. While we visited the property on Monday, September 15, 2014, we could hear chainsaws in the distance but could not determine where the sound was coming from. Therefore, we suspect that more trees are being destroyed, but cannot determine exactly where. 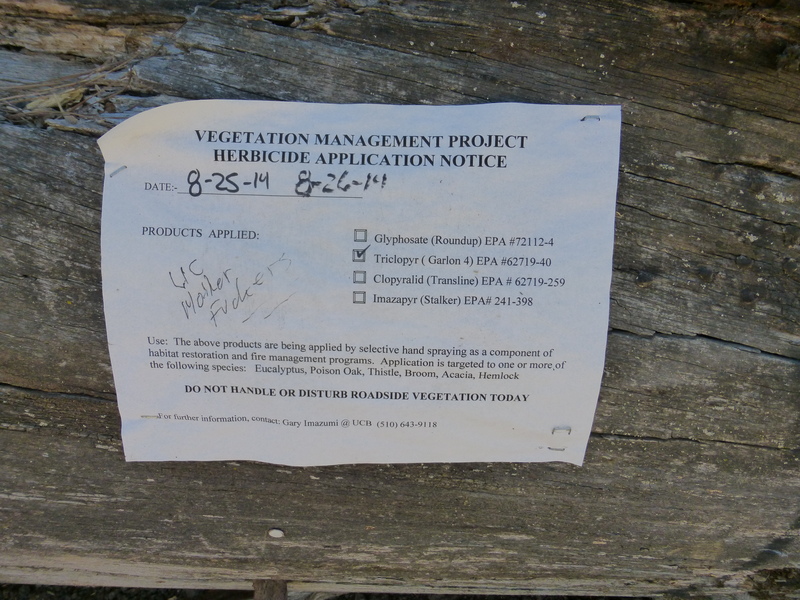 The Pesticide Application Notice gave the name of a person at UC Berkeley (Gary Imazumi) who is responsible for this project. (For the record, we are not responsible for the graffiti scrawled on that sign.) We have contacted him and asked for more information about the entire scale of the project and a timeline for its completion. We have also asked him what will be done with the huge piles of dead vegetation that are now lying on the ground. We have not received a response to our questions. Has the Draft EIS for the FEMA grants to UC Berkeley for tree removal been approved? Has the FEMA grant to UC Berkeley been awarded? If the EIS and/or the grant have not been approved, can UC Berkeley be reimbursed for expenses it incurs prior to the award of the grant? The trees that UC Berkeley destroyed on August 24-26 are still lying on the ground several weeks after they were cut down. They have not been chipped or hauled away. The Draft EIS made a commitment to chip the destroyed trees and distribute them on the ground. Is there any time frame for this disposition of the destroyed trees? Should the public expect dead trees to spend weeks or more on the ground after they are cut down? As you know and the daily news confirms, we are now in the height of fire season. Does it seem consistent with fire hazard mitigation to use chainsaws at this time of year, particularly after several years of drought? Does it seem consistent with fire hazard mitigation to leave dead vegetation lying on the ground during the height of the fire season? Does FEMA believe that dead vegetation is less flammable than living, standing trees? We understand that some of these questions are rhetorical and we don’t expect answers to any but the first three questions. The rhetorical questions are not intended to put you in an awkward position. They are intended to express our opinion of UC Berkeley’s hypocritical claim that destroying living trees will reduce fire hazards. We just want FEMA to know what is happening and to take it into consideration before finalizing the EIS and/or awarding the grant, if FEMA has not already done so. 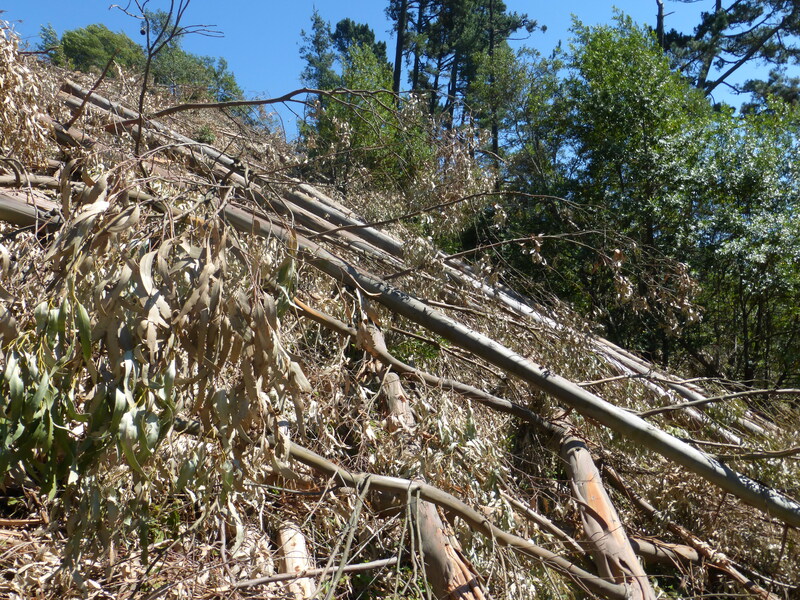 Update: On December 1, 2014, FEMA published the final Environmental Impact Statement for the “Fire Hazard Mitigation Grants” in the East Bay Hills. As a result of UC Berkeley’s premature removal of trees in the project area prior to the publication of the EIS and prior to the award of the grants, the final EIS says that UC Berkeley will not be awarded grant funding for the Frowning Ridge portion of their grant application. The following is an excerpt from the Executive Summary of the final EIS (page 17) which is available HERE. However, we should not assume that this prohibition will remain when the EIS is officially approved by the “Decision of Record” on January 5, 2015, because we assume it is being challenged by those who support this project. “In August 2014, UCB undertook environmental treatment measures on approximately 7.5 acres of the 185.2-acre project area at Frowning Ridge. 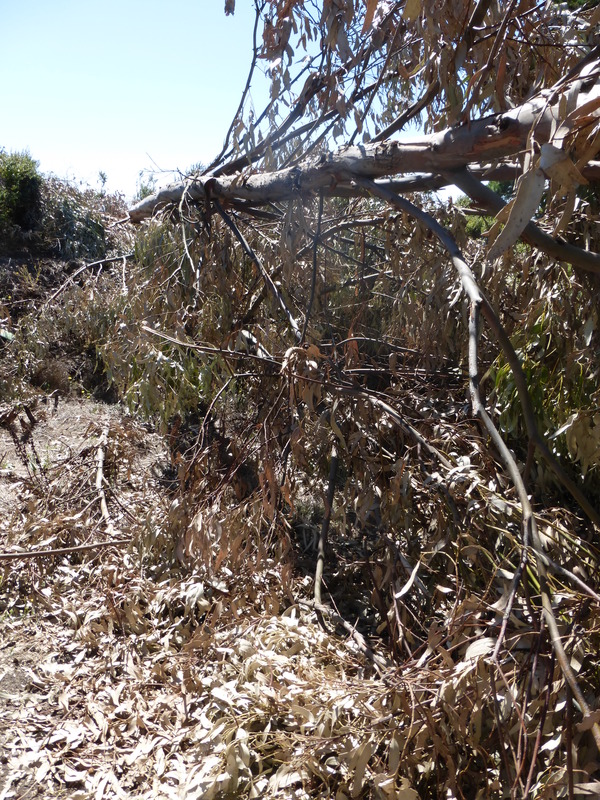 According to UCB, they felled 150 eucalyptus, Monterey pine, and acacia trees, and applied an herbicide to eucalyptus and acacia stumps. In undertaking these actions prior to issuance of the final EIS, UCB failed to comply with both the specific conditions of the grant and also the NEPA requirement which limits applicant action during the NEPA process under 40 CFR 1506.1. Both required UCB to refrain from action until FEMA had completed its environmental review. As a result, the Frowning Ridge project area is no longer eligible for PDM program grant funding. What a backward lot of people, creating backward policies. Thank you so much for showing us this horror. I’ve been seeing piled up dry tinder cut by various agencies piled up along trails and even roadsides. Some have been in the EBRParks for years, but they have time to cut more trees? I’m beginning to think they want a major fire because they will make money.